A stretching of the area where gas is exchanged in the lungs, it is a characteristic of emphysema. Test that uses sound waves to create a moving picture of the heart. The picture is more detailed than an x-ray image and involves no radiation exposure. A dose of some chemical that results in 50% of the population having a therapeutic advantage. Gathering of fluid in tissue, or in a serous cavity, causing swelling, distention, and compression. It is associated with a weak heart or bad kidneys. The ability to achieve something. A collection of fluid in a body cavity, usually between two close together tissues. For example, a pleural effusion is the gathering of fluid between two layers of the pleura (the sac lining around the lung). Stands for Epidermal growth factor receptor, a protein found in some cells, this causes the cells to divide, and is found on many types of cancer cells, they divide quickly when the protein is present. Medical test that shows the way a person�s heart beats. A recording of the electrical activity of the heart. An electrocardiogram is a simple, procedure. Electrodes are placed on the skin of the chest then it is connected in a specific order to a machine that, when turned on, measures electrical activity of the heart. The results are usually in the form of a long scroll of paper displaying a printed graph of activity. Newer machines put the information on a computer and screen, although a print-out may still be made. A treatment for cancer that destroys cancer cells by burning with electricity. An electrically charged mineral found in body fluids, tissues and cells. It must be maintained within a certain range to prevent organ malfunction. A technique used with microscopes, they use a beam of electrons to produce an image up to 400,000 times its normal size. A test used to detect the presence of antibodies in a serum. This is a blood clot in the lungs. A lung condition featuring an abnormal accumulation of air in the lung's many tiny air sacs, a tissue called alveoli. As air continues to collect in these sacs, they become enlarged, and may break, or be damaged and form scar tissue. Emphysema is strongly associated with smoking cigarettes, a practice that causes lung irritation. It can also be associated with or worsened by repeated infection of the lungs, such as is seen in chronic bronchitis. The best response to the early warning signs of emphysema is prevention: stop smoking and get immediate treatment for incipient lung infections. Curing established emphysema is not yet possible. Because patients don't have an adequate amount of space in the lungs to breathe, they gasp for breath, and may not be able to obtain enough oxygen. Those with severe emphysema usually end up using an oxygen machine to breathe. In some cases, medication may be helpful to ease symptoms or to treat infection in already-damaged lungs. Pus in the chest that can result after an operation for mesothelioma. A chronic disease of the lungs, which parts of the lungs used for breathing have been destroyed by disease which prevent proper exchange of gases within the lungs. As a result, new air in the lung cannot be properly used. Any disease of the brain. Glands that release hormones into the blood. A system of glands that regulates bodily functions using hormones by releasing them in bloodstream. The endocrine system includes the hypothalamus, pituitary gland, thyroid, adrenal glands and gonads (ovaries and testes). A lighted instrument that is inserted through an incision. A procedure to look at the inside of a body cavity, such as the esophagus (food pipe) or stomach. A part of a protein, collagen 18, found in all blood vessels. This part is normally released by tumors. It appears to halt the process of developing new blood vessels (angiogenesis) which is necessary to tumor growth. Works with angiostatin. Lovastatin, a cholesterol drug shown to stop the growth of cancer cells. Endostatin may be used to treat cancer in the future. Inspection of body organs using a flexible, lighted tube called an endoscope. The layer of epithelial cells that cover the heart, blood, lymph vessels, and the serous cavities. Marker of disease progression, either symptoms or death. Bone marrow infused during a BMT that is accepted by the patient, and begins producing blood cells. A coating on a pill that lets it pass through the stomach without dissolving. Used for drugs that aren�t activated by the stomach acids etc. A nurse with special training for caring and teaching people with ostomies (such as colostomies) or wounds. A nurse with this training may be referred to as an "ET nurse." An organisms surroundings, that can have a change on it. Exposure to asbestos that is present in the surroundings. A protein that helps a chemical reaction. A statement that explains medical benefits, account activity, and explains why claims may or may not have been paid. A white blood cell that fights against allergic reactions and defense against parasites. Refers to the staining of certain tissues, cells, or organelles after they been washed with eosin, a dye. Eosin is an acidic dye, thus the structure being stained is basic. Eosinophilic describes the appearance of cells and structures seen in histological sections which take up the staining dye, eosin. This is a bright pink dye that stains the cytoplasm of cells as well as extracellular proteins such as collagen. Such eosinophilic structures are generally composed of protein. The stain eosin is usually combined with a stain called haematoxylin to produce a haematoxylin and eosin stained section (also called an H&E, HE or H+E section). This is the most widely used histological stain in medical diagnosis - for example when a pathologist looks at a biopsy of a suspected cancer they will have the section stained with H&E. US Government agency that protects human health and the environment. It is particularly concerned with the protection of humans against cancer producing fibers like asbestos. Studies how health develops in a specific population. The study of diseases in populations by collecting data. In the field of cancer, epidemiologists look at how many people have cancer; who gets specific types of cancer; and what factors (such as environment, job hazards, family patterns, and personal habits, such as smoking and diet) play a part in the development of cancer. A tube which allows injection of an anesthetic drug into the space between the wall of the spinal canal and the covering of the spinal cord. This offers quick relief from pain after an operation for mesothelioma. 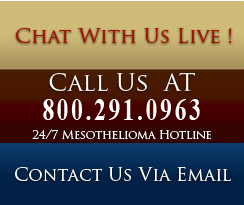 Rare lung disease, this type of mesothelioma has the best outcome for patient comfort, and life expectancy. Cells that line the internal and external surfaces of the body; used to describe the appearance of the cells under the microscope for the most common type of mesothelioma. One of the four main bodily tissues, they compose the linings of organs and membranes as well as the skin. These cells line the insides of the lungs. Cancer or tumor that is from epithelial cells. The skin and mucus membranes that are on the outside of the body. A herpes virus. EBV infection is common in children and may cause infectious mononucleosis in young adults. EBV lies in the lymph nodes. It is associated with oral hairy leukoplakia, lymphoid interstitial pneumonitis and some types of cancer in people with AIDS. Red blood cell that carries oxygen to body cells, and carbon dioxide away from body cells. A drug-resistant virus that has mutated so it is no longer affected by a drug. A special type of speech used by some people after surgery for cancer in the voice box (larynx). Air is swallowed and a "belching" type of speech can be produced. New devices, improved surgery, and the use of chemotherapy and radiation therapy instead of surgery, have reduced the need for learning esophageal speech. Esophagus that has become swollen and inflamed, making it difficult to eat or drink. The tube that connects the throat with the stomach. The esophagus lies between the windpipe and the spine. It passes down the neck, past the diaphragm just to the left of the midline, and joins the upper end of the stomach. In an adult, the esophagus is about 25 centimeters (10 inches) long. When a person swallows, the muscular walls of the esophagus contract to push food down into the stomach. Glands in the lining of the esophagus produce mucus, which keeps the passageway moist making it easier to swallow. Also known as the gullet or swallowing tube. From the Greek oisophagos, from oisein meaning to bear or carry + phagein, to eat. A branch of the law that tries to give the best benefit of the laws of wills, trust, taxes, insurance, and property while helping a person carry out their wishes of their property upon death. The cause of a disease. In cancer, there are many causes, research is showing that both genetics and lifestyle are major factors in many cancers. Services or supplies not covered under a health plan. Any sort of contact with a substance that gets into the body, either from swallowing, breathing, cuts, skin, or eyes. Radiation therapy that has a machine aim high-energy rays at the cancer. It can be called external radiation. Most commonly used after removal of an entire lung for mesothelioma. Radiation is directed onto the skin that targets a cancer region within the body. Radiation therapy using a machine located outside the body to aim high-energy rays at a tumor or cancer cells. The surgical removal of the pleura, diaphragm, pericardium and the whole lung on the side of a cancer tumor. It is used to remove all or most of the cancer and some surrounding tissues as well. Leaking of intravenous fluids or medications into tissue surrounding the infusion site in the body. Extravasation can cause tissue damage. A new procedure that might replace standard axillary lymph node dissection. Blue dye or a radioisotope tracer is injected into the tumor site at the time of surgery and the first (sentinel) node that picks up the dye is removed and biopsied. If the node is cancer- free, no more nodes are removed.